Bob Daisley deserves your respect. He was the guy behind so many other famous guys when metal was on the rise during the early '80s, and on through the rest of the decade. His most-renowned credits include writing for and playing bass with Ozzy Osbourne, plus working with Black Sabbath, Rainbow, Uriah Heep, Gary Moore and others. Aside from his blazing four-string skills and road-dog ethics, he's also one helluva songwriter, penning much of Ozzy's first two-and most successful-solo albums. But his tumultuous relationship with Ozzy and his shrewd wife/manager Sharon eventually resulted in extensive legal battles and the removal of Daisley`s bass parts from the very same albums he helped create! But long before the hubbub over pilfering royalties erupted, Mr. Daisley released an uncanny little prog album in his native Australia with his band, the oddly titled Kahvas Jute. For the most part, the exposure I've had to progressive rock has been primarily through bands like Rush, Pink Floyd, Yes, Genesis and a few others that had massive commercial success during the '80s. But the prog arena is vast and varied-ranging from denim-clad hair farmers, to costumed artistes and new wave modernists-and many smaller bands have come and gone, while a scant few have remained cult favorites. 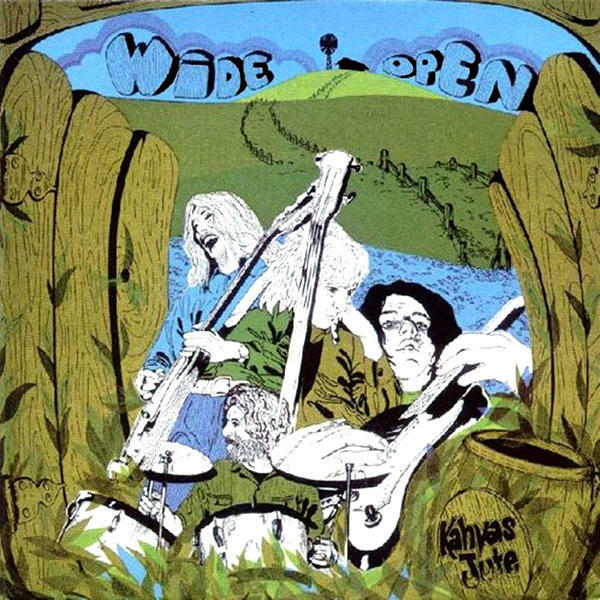 Kahvas Jute is one such band, with prices for original vinyl copies of the band's sole album Wide Open fetching several hundred dollars on auction sites of late. Kahvas Jute came together in 1970 from the ashes of Aussie obscurists Mecca (Bob Daisley on bass and Dennis Wilson on guitar) and the band Tamam Shud (Tim Gaze on guitar and Dannie Davidson on drums). Kahvas Jute's hazy combination of heavy blues, erratic jazz, down-home folk, spacey psychedelia and impressive twin-guitar interplay made them a unique experience in the clubs of Sydney, and they'd soon ink a deal with Infinity Records. Heavily influenced by the harder sounds coming out of England like Cream, the Jimi Hendrix Experience, Led Zeppelin and the Jeff Beck Group, the band recorded this sole album in just three days. The album did pretty well on the Australian charts, but Gaze would soon leave and the rest of the band would play their final gig in Sydney in 1971, before trying their luck in the UK. When the London scene didn't pan out, Wilson and Davidson would eventually reform the band back home in 1973, with Daisley remaining in England. This second version of Kahvas Jute would not record anything further and would eventually break up in 1974. Thus, the magic had long since gone. As for the album itself, I felt compelled to check out this new reissue (Aztec Records), largely because I've been familiar with much of Daisley's work, but never knew anything about his early band. And since I was never really into prog-the long songs, the virtuoso approach, complex timing, difficult structures and such - I wasn't sure I'd get it. But this offering is a bit different, as there are coherent melodies, blazing guitars, brash bluesy bits and well-defined hooks. The album opens with the folksy "Free". At first, I found this number to be a bit slow and lazy, as it meandered moderately through five minutes of jangly guitars and Wilson's laid-back vocals. But upon further listening, I got it. Laden with texture and subtlety, the song is at once tuneful and complex-two characteristics that exemplify the album as a whole. "Odyssey" is a proto-metal gem not too far off from Cream's heavy blues jams, and features Daisley's frenetic bass runs throughout. "Up There" has a smooth, jazzy feel with more of Daisley's fancy bass bits, plus some excellent duo guitar work. The band further kicks out the jams on "She's So Hard To Shake" and "Parade of Fools" where the Hendrix influence is omnipresent. But there is also a softer side to Kahvas Jute, especially on the melodic "Vikings" with its acoustic foundation and soulful guitar licks. "Steps Of Time" is spacey soft-psych with an erratic chorus that lifts it out of the haze temporarily before breaking into a jazzy interlude embellished with more stellar axe work. And "Twenty Three" in all its weirdness - it's an addictive, melodic ballad with a far-out-of-left-field drum solo-is one of the album's high points. Aztec's reissue also features several bonus tracks culled from reunion gigs last year where the band made its triumphant return to the stage. Another nice thing about this release is that the band is actually getting paid-prior reissues have not always been on the level. Kahvas Jute was one of those bands that defied easy categorization, stylistically spanning heavy rock, prog, psychedelia, blues, country and folk rock. And although they may never receive the wide-ranging credit they deserve, the band's legacy as trailblazers lives on in this release. Bob Daisley's career has seen him become one of Australia's most successful exports, in album sales as well as his numerous creative achievements. With Daisley's pedigree alone, Kahvas Jute is worth seeking out…and no, the name doesn't mean anything.